Recipe Instructions: Simmer the hot honey, water and cannabis together in a pot or slow cooker. Decarb the cannabis buds before hand or use the hot honey to activate the THC and other cannabinoids. 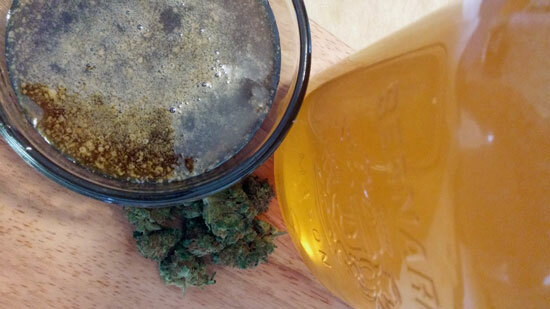 Learn a quick do-it-yourself recipe for how to make cannabis infused honey. It’s easy to cook, super sweet and can be very potent! What is cannabis infused honey? How do you make cannabis honey? How do you use cannabis honey? Does cannabis honey get you high? When should I consume cannabis honey? Can I store cannabis honey? The sweet substance produced by bees, called honey, is a great receptacle for the cannabinoids present in cannabis. 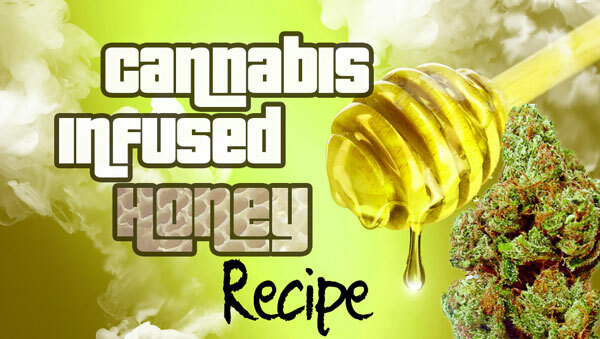 By infusing the cannabis with the honey, a type of extraction is made that can be used in all types of cooking. Making cannabis honey is easy! Basically, all you have to do is heat up the honey with the cannabis. You’ll want to do it with a very low heat, as the honey can release carcinogens at scalding heats, like coconut oil does. We’ll show you how to make cannabis honey step-by-step with a full recipe that you can cook at home (below). Cannabis honey can be eaten in a number of dishes including sweet desserts, hot and cold teas, or even consumed as pure honey! If cooked long enough the honey will harden and turn into a type of cannabis honey oil. Be sure to check the dosage before you partake in the consumption of all cannabis edibles, including honey. Yes. Cannabis infused honey has the potential to carry cannabinoids such as THC and CBD. 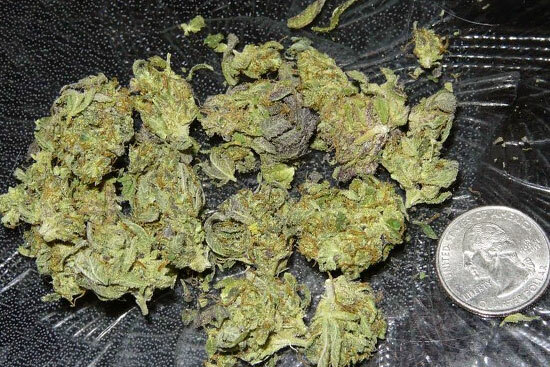 THC is the active chemical in marijuana that stimulates the psychoactive effects (the high). Respective to the amount of weed used to infuse the honey with, the potency of the batch corresponds to that. Medical marijuana patients will want to analyze their desired THC:CBD ratios for their medication and opt for cannabis honey that fits accordingly. Assuming the consumer of the cannabis honey has a legal right to use it, consuming cannabis is edible form is certainly much healthier than smoking. Studies have yet to show any real concern to health when eating cannabis edibles, however we advise legal marijuana patients to start with smaller doses, to get comfortable to the effects. Depending on the potency of the resulting batch, you may consider indulging in the cannabis infused honey during the later hours of the day. 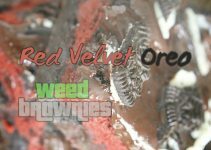 Often times with edible medical marijuana products, a strong body high is felt which may lead to effects of drowsiness and relaxation. Yes. 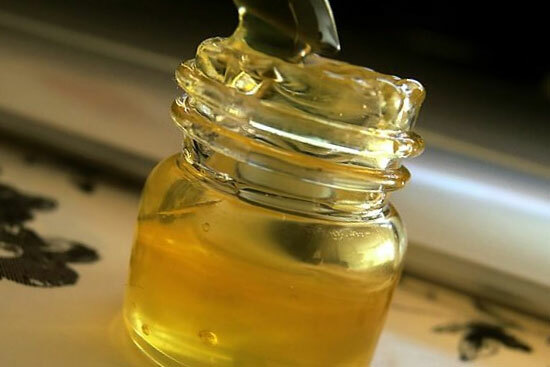 Cannabis honey may be stored long-term in sealed containers, such as jars. Remember that the liquid hot honey will harden considerably once it’s cooled down. Storage of cannabis honey is performed in a dark, cool area in a airtight jar. Let’s get right into making our own cannabis infused honey at home. The first thing we’ll want to have is the cannabis. You can use buds, leaves or both but the important thing is to guess your dosage. There’s no real way of knowing beforehand how strong the batch of cannabis honey will be, unless you are a scientist, consider how high you would get if you smoked all of that as a rule of thumb. 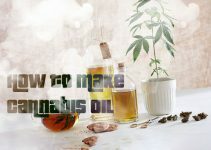 Now that you’ve got the amount of weed you want to use figured out, we’ll need to find some way to heat it up, in order to activate the THC cannabinoids. Surprisingly, raw cannabis does not have the type of THC we commonly know to get us high. 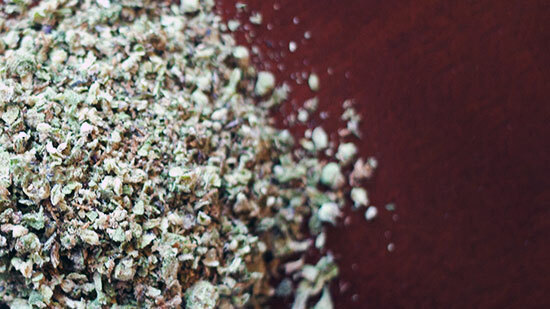 Rather, THCA is present in raw marijuana, which upon heating converts it’s chemical structure to what we all love – THC. This process is called decarboxylation and is the backbone of all cannabis cooking, also benefiting medical marijuana use cases by turning CBDA into the therapeutic CBD. We can heat the cannabis up beforehand in an oven on low 230°F heat (that’s 110°C) for half an hour. This is not too hot that it will vaporize the cannabinoids away, and then you can be assured that all of the weed is activated prior to mixing with the honey. We can heat the honey and the cannabis together, thus activating the THC in the process. This method is the easiest for most people. However, remember that while hot honey will be an easy to handle liquid, often times upon cooling it will turn rock solid. Consider adding water or some people do coconut oil to help the cannabis infused honey become manageable in storage. For any case, breaking the weed up into small pieces by using a grinder or a knife will help to assure all of the THC and CBD gets infused into the honey once it’s cooking time. This recipe can scale to fit larger needs. For now we’ll keep it small by only using an eighth of weed and a 6 ounce jar of honey. If you need to make more or less just adjust the proportions accordingly. Preheat the honey in a pot or a slow cooker over simmering low heat. Add half the amount of water as honey to ensure against hardening. 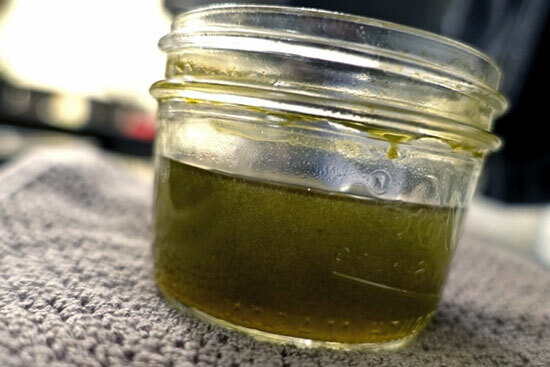 Once the soupy mix of honey and water is heated up, you may put in the cannabis. Take the cannabis buds or leaves and wrap them in a screen or cheesecloth first. This will prevent any large particles of plant material from mixing in with the honey. Now insert the wrapped cannabis into the simmering pot and cover it. Maintain a low heat. Leave this batch brewing for up to a full day in order to infuse with the most potential. Ideally a longer, slower cook is preferred. However, there are many cases of potent cannabis honey being created in under an hour, so cook for the allotted time of your discretion. Finally, when you are ready to turn off the heat, get the storage jars ready (I like to use wide mouth Mason jars) by lubricating them with the coconut oil. This will help prevent the honey from sticking to the sides of the jars as it cools. That’s it! 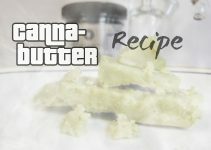 Congratulations you just learned how to make cannabis infused honey! Remember to keep your new honey stored in a dark location within a tight, air-free container for best results. 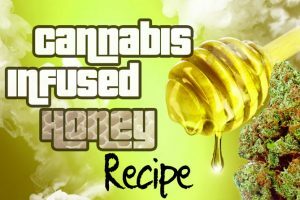 If you have any cannabis honey recipes of your own, please feel free to share them in the comments below!